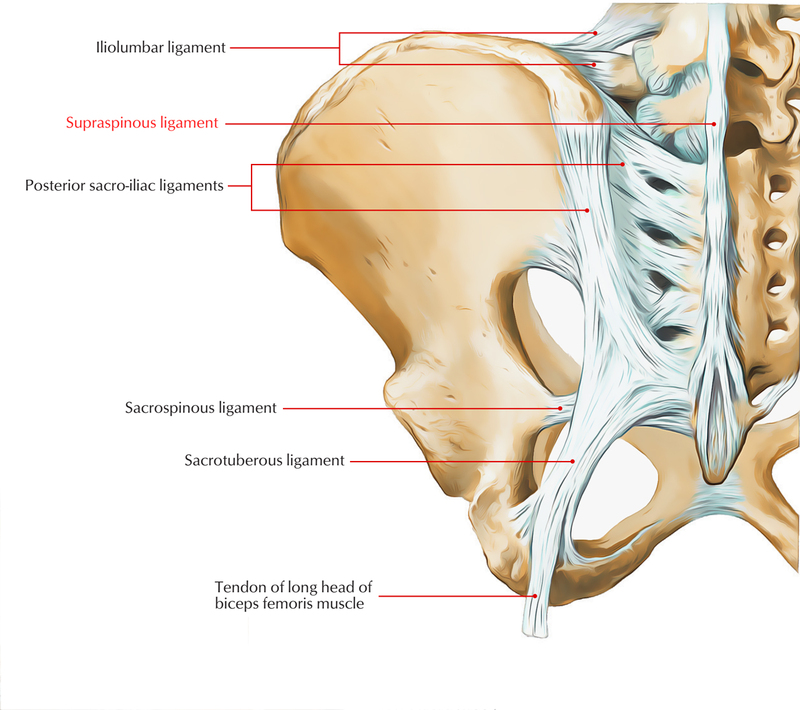 The supraspinous ligament is a strong fibrous band, which connects the apices of the spinous processes from the C7 vertebra to the sacrum together with each other. Fibrocartilage is cultivated in the ligament, at the points of association towards the tips of the spinous processes. It is denser and wider in the lumbar compared to the thoracic region, and in both situations closely merged together with the neighboring fascia. This ligament has the most superficial fibers stretched over three or four vertebrae. More deeply placed ones travel in the middle of two or three vertebrae; however the deepest ones attach with the spinous processes of neighboring vertebrae. In the middle of the spinous processes it is constant with the interspinal ligaments. It is constant upward towards the external occipital protuberance as well as median nuchal line, as the ligamentum nuchae. The supraspinous ligament attaches as well as travels alongside the apices of the vertebral spinous processes from vertebra CVII towards the sacrum. From vertebra CVII towards the skull, the ligament turn out to be structurally separate from more caudal portions of the ligament and is known as the ligamentum nuchae. From the external occipital protuberance to the foramen magnum, the base of the triangle is attached to the skull. Top part is connected to the tip of the spinous process of vertebra CVII. The deep aspect of the triangle is connected towards the posterior tubercle of vertebra CI as well as the spinous processes of the other cervical vertebrae.